Choose the right type of petunias to create a full, cascading basket of blooms. 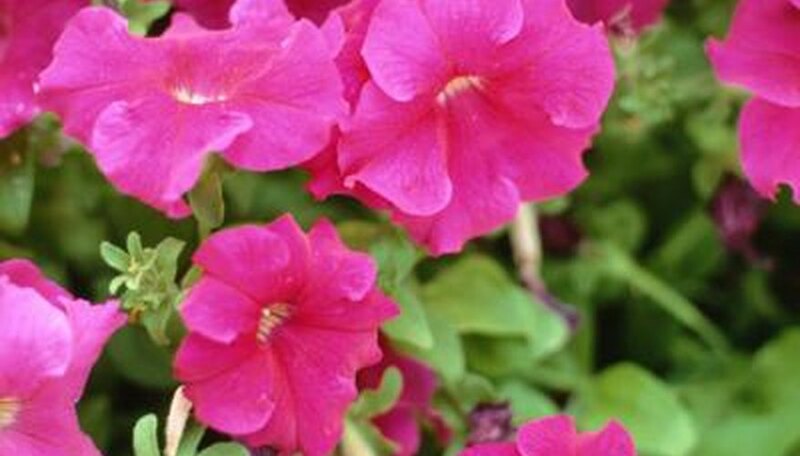 Purchase plant varieties such as The Wave or Supertunia which are cultivars bred specifically for their spreading tendencies. These plants, if properly watered and fed with a regular dose of fertilizer, will spill over edges of pots in no time for gorgeous show. Other varieties of petunia can also be grown to cascade over the sides with a little work. Line the bottom of your container with packing peanuts, rocks or clay pot shards to help provide proper drainage and oxygen flow and protect the pot from losing soil. Packing peanuts work best for hanging baskets because they won't add additional weight. Fill three-fourths of the way full with a quality potting soil. Add your seedlings, ignoring the plant information for spacing. When putting together a container, you want to overload the plants to quickly create a fuller look. Since container gardens need more fertilizer and water than garden beds, the roots will not be competing for nutrients so proper spacing is not needed. Fill in the container with potting soil, covering the seedling roots to the crown. Water and fertilize as per the instructions on the fertilizer. Petunias respond well to a water-soluble quick-release fertilizer. Snip all blooms with a pair of garden shears or clean, sharp scissors right below the bloom base. An annual's life cycle consists of root and stem growth, producing flowers and then going to seed. By removing the blooms, you force the plant to continue growing. Allow the plants to start blooming when you are satisfied with the growth of your plant. Prune a few stems here and there to help the container along in the shape you wish it to grow, allowing stems near the edges to grow while trimming the insides to create a bushier effect, if desired. Properly cared for petunias will do this naturally but being helped along can give you the shape you desire. Water and fertilize on a regular basis to avoid distress, and your petunias will spill out and cascade over the sides of your containers in no time. In mid-July, petunias begin to get "leggy"-- that is, have long, thin stems with small leaves and just one bloom on the end. Prune a few stems back to two-thirds every few days to promote new growth and a second burst of beautiful blooms until frost. Do not prune back the whole plant at once as the stress will probably kill the plant. Allow some time to heal between prunings. Deadhead blooms by trimming off spent blooms right below the base to keep the plant from going to seed. Once seed-production starts, the plant switches to the final part of its life cycle and will produce less blooms.